My friend came up with a genius idea! After I made her baby boy a quilt she asked me whether I could work the leftover fabric scraps into a pouch for her. I mean seriously, of course I said yes. Not only do I enjoy making pouches, I was IN LOVE with the idea that she would carry around a small version of her baby’s quilt. And I’m almost sure a lot of my fellow quilters can appreciate the awesomeness of this as well! The baby quilt in question I showed you a couple of weeks ago. I never found a good name for it, so it got the descriptive title of Grey to Green Ombré Baby Quilt. I didn’t want to make an exact replica of it in form of a pouch, my goal was more to stay with the core idea of ombré. This turned into a simple task: I cut up all the scraps I had left over from the project into 2” squares. I added a couple more gray fabrics I found in my scrap basket to great an even distribution of colour. I then pieced them together and proceeded with my usual pouch making technique, which is based on this tutorial with an added lining. 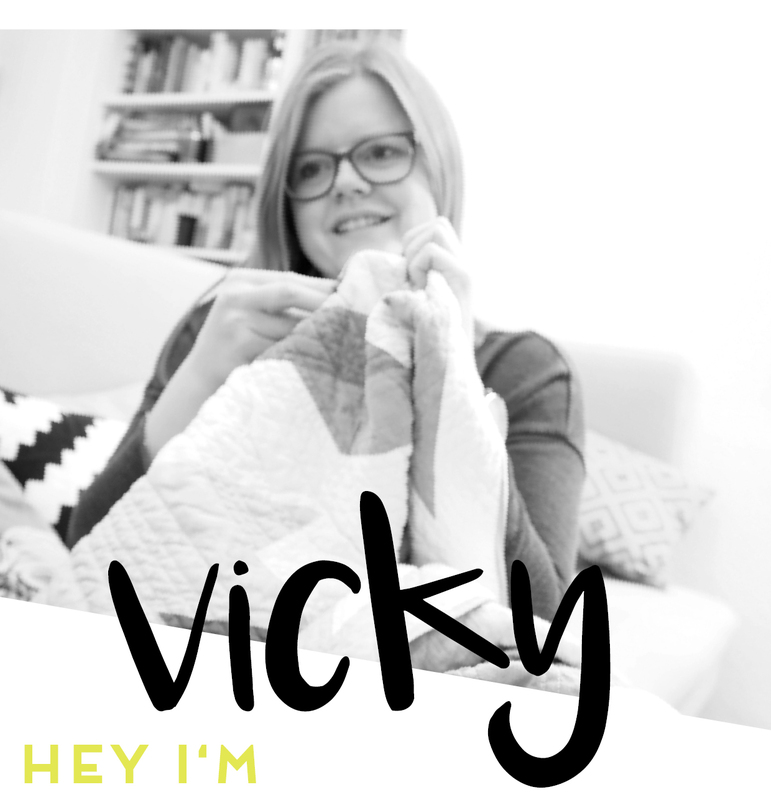 This post is linked up with Modern Patch Monday at Modern Cologne Quilters, Let's Bee Social at Sew Fresh Quilts and Needle and Thread Thursday at My Quilt Infatuation. I hold an advanced degree in procrastination, but when I’m excited about something I can jump into it head first. That’s how my sewing space came about. Up until this summer my quilting supplies were stashed in a bookcase in our living room. If I wanted to sew I got what I needed out of the bookcase and set camp on the dinner table. We live in a small apartment downtown. While we enjoy the urban surroundings our space is limited. Thus it had always been out of question that I could dedicate a room to my quilting hobby. As my fabric stash kept growing things got a little out of hand; there just wasn’t enough storage space and I kept getting annoyed by having to clear the table each night. We thought, that this was just the way things were and we had to live with it until we’d eventually move. I don’t remember what initiated it, but one day this summer I thought to myself that if we redid our office, got rid of a couple of things and put most of my remains from architecture school in the cellar, there could actually be just enough room to host a dedicated sewing table. That idea, like a spark, initiated some frantic pinterest searching for tiny sewing spaces, corners, niches, nooks, you name it. This image of a fresh, lively yet clean enclave (??) formed and I put together a mood board that I proposed to my boyfriend. He’s happy when I am, and I’m pretty sure he loved the idea of moving all things sewing out of the living room – proposal accepted! Next, my planning skills came in handy. I took our office’s measurements, drew up a floor plan, calculated dimensions and picked out pieces of furniture from IKEA accordingly. And when our original plans to go canoeing were canceled by the provider that weekend, off to IKEA we drove. I didn’t buy all the things I had originally picked out, but all the essentials. I had to work on a budget and I like the idea of adding pieces I find along the way, too. And I went with a different carpet that now covers he floor in the niche completely. I am a sucker for carpet under my feet! The sewing nook is tugged behind our convertible couch / guest bed at the back of the room. The sofa is covered with my Glass Half Full quilt. I didn’t originally intend to keep this quilt, but when I saw how well the colours harmonize with the other green hues I decided to keep it. My sewing table isn’t big, but it holds my notions and thread in two drawers, which are now within reach without taking up space on the table. And since I was able to put up a design wall, I don’t have to lay out blocks and design on my table either. When I sit and work Í have my machine to my right and my cutting mat on the left and can easily switch between cutting and piecing. 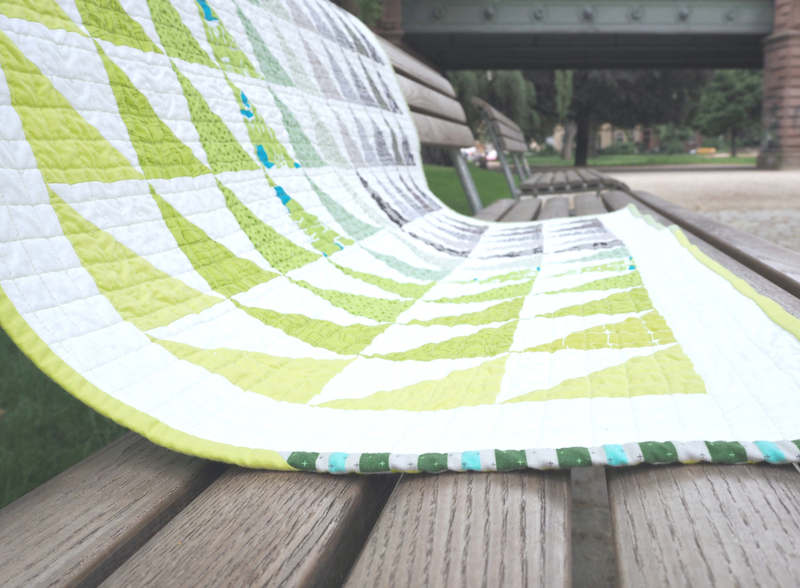 This is a love story of a quilt pattern and a collection of fabrics that were meant to be. If I buy a fabric collection as a whole it must be special. I’m more of a picky type with my fabric purchases: I’d rather buy my fav prints in yardage than spending money on a bundle where I only really love half of the designs. But when Alexia Abegg’s current line Printshop (for Cotton + Steel) came out this summer, I knew I needed to have all of those colourfully stamped fabrics, every single one. And when the bundle of yummyness arrived there was no way I was going to pull it apart. So I had this bundle stashed away in a save place in my fabric cupboard, to be admired from time to time. I had thought about using it in a special quilt with a special design for a special occasion…. you see it wasn’t going to go anywhere anytime soon. But then one glorious, sunny day (enter Prince Charming) Julie Hirt’s Hexie Tiles came along and swept me off my feet. Now this was a pattern worthy of my precious Printshop fabrics! The paper piecing template for the Hexie Tiles consist of two pieces, which sewn together form a hexagon with a fan like center. There are more ways to combine the two pieces to form other shapes, too. Some of these are shown in her pattern. And as I was playing around with colour placement I found another arrangement that forms wide flying geese made up of two stacked triangles. I love this variety of patterns the templates offer and would have loved to combine them into a sampler style quilt. Unfortunately I ran out of the Essex Linen I used as the background, which left me with not nearly enough material for a quilt. However I have enough to make two pillow covers from it. I decided to make one panel with the original hexie arrangement and one with the flying geese formation. Currently I’m pondering how to quilt both of them respectively. I think about maybe only quilting the background, so the coloured parts pop like gem stones. Does this sound any good to you? This post is linked up to Handmade on Tuesday, Fabric Tuesday at Quilt Story, Let's Bee Social at Sew Fresh Quilts, Needle and Thread Thursday at My Quilt Infatuation, TGIFF this week at Rainbows, Bunnies, Cupkaces, Finish it Up Friday at crazy mom quilts and Modern Patch Monday at Modern Cologne Quilters. One of the most humbling things to experience as a maker is someone loving your work so much, they request a piece of it to go into their home. A lovely friend of mine asked me to sew a baby quilt for the nursery she was just setting up for her baby boy Charlie, expected to arrive in July/August. She was decorating the room in greys and a soft pastel green, which turns out to be such a calm, serene colour combination. After sending design ideas back and forth we settled on a grey-to-green ombré layout, set in half square triangles. I had to shop around for some bridging fabrics, meaning prints with both grey and green in it. This turned out to be an extremely rare combination! Luckily Heather Givans put some in her Succulent line, which I love a lot. To be honest, I wouldn’t have picked grey and green for a quilt, had it been up to me. The more suprised I am that I actually very much appreciate the different shades together. I think it’s a warm, fuzzy scheme and a very understated one, much like Charlie’s room. The design brainstorm and tossing of ideas also reminded we why we need community and interaction, even in a seemingly solitary craft like quilting. Without input we’d get stuck in our ways and make the same stuff over and over again. How boring that would be!